Meltwater will serve as meeting and classroom space at the University of Wisconsin-Milwaukee. 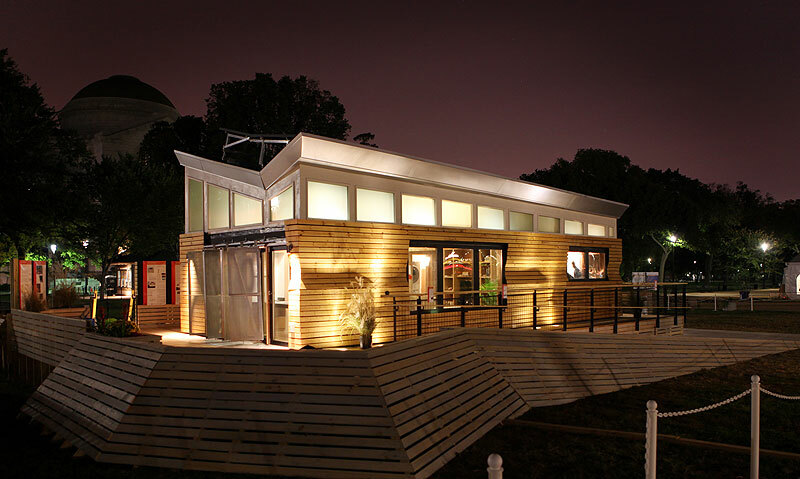 The University of Wisconsin-Milwaukee's Meltwater house was relocated to Milwaukee's State Fair Park after leaving the U.S. Department of Energy Solar Decathlon 2009. The house served as an exhibit at the annual home show of the National Association of the Remodeling Industry, which took place on the fairgrounds in February 2010. While at the conference, an estimated 20,000 people visited the house to learn more about its innovative systems. Decathletes from the University of Wisconsin-Milwaukee (UWM) used the local landscape as a source of inspiration when creating their house for Solar Decathlon 2009. Melding the geologic past with the latest solar and building technologies, they created Meltwater. The house features photovoltaic panels placed on an inverted, butterfly-shaped roof. This design is reminiscent of the glacial valleys carved in Milwaukee's Menomonee Valley. It is fitting, then, that Meltwater would return to its home state following the competition on the National Mall. In 2013, UWM’s School of Architecture and Urban Planning department joined forces to bring the house back to campus. Today, it is located on the southeast corner of Sandburg Residence Hall, where it will be used by the university for meeting and classroom space.